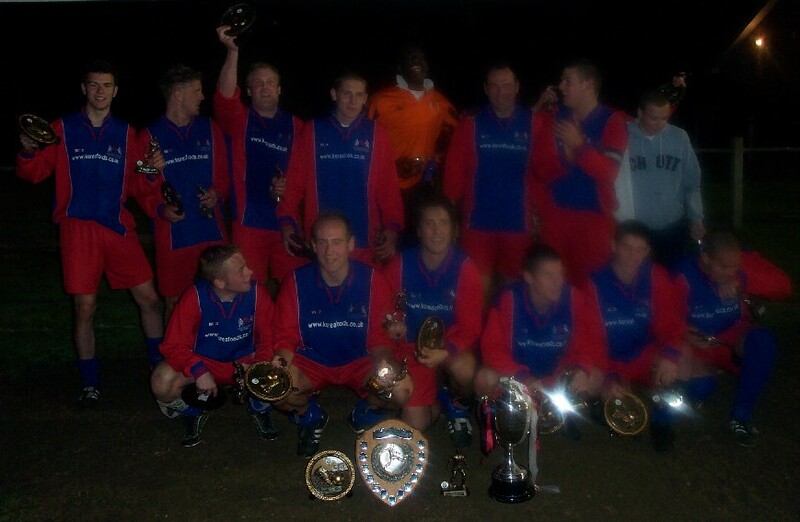 The Raynes Park Vale 2nd team won the Challenge Shield Final after beating Westfield 2-1. A goal down with a minute of normal time to play, Rob Hill snatched an equaliser and then also got the winner in extra time. Vales Dave Herd was voted Man of the Match. After the game the team was also presented with the Divison One Championship Trophy, which they clinched 48 hours earlier by beating Bedfont 2-1. Vale needed a all three points from this game to clinch the Reserve Division Championship but it was Bedfont who started the stronger team. Bedfont dominated the early stages and were soon in front when a good passing move opened the Vale defence and the a good finish left Vale keeper Terry Clinton stranded. Bedfont were soon on the attack again and for the first 30 minutes looked like they would overwhelm Vale when shots hit the post and crossbar. Vale keeper Terry Clinton was twice called upon to make excellent saves to keep Vales hope alive. It was a physical encounter that saw three Vale players booked in the first half. Vale then lost two players through injury and were forced to make early substitutions bringing on Andy Hedding and Kenny Dowling. Towards the end of the half Vale came back into the game but failed to make any impression in front of goal. Vale did have a penalty appeal turned down when Ben Roberts was tripped inside the box but the referee waved away the appeals of the Vale players. The second half was just as physical as the first with both sides looking very committed. Vale started to edge the game and created the better chances but again lacked the finish when in front of goal. Bedfont looked solid at the back but seemed to lack any punch up front as the Vale back line started to dominate. The game turned in the 25th minute when a crude tackle on Vales Dan Philp went unpunished by the referee. Somehow the officials managed to miss the lunge by a Bedfont player who had already been booked and as Dan Philp protested to the referee he was amazingly shown a red card for dissent. It looked like curtains for Vale but somehow they managed to lift themselves and applied pressure on the Bedfont defence. John Waddingham advanced down the right and collected a ball from the centre of midfield. He went past two defenders then cut inside to fire a superb left foot shot into the bottom corner of the Bedfont net. Vale continued to attack and a few minutes later went in front when a through ball found Rob Hill on the left hand edge of the Bedfont penalty area. His first touch took him wide of the Bedfont defender and he fired his left foot shot low past the keeper to give Vale the lead. Vale defended bravely as the referee managed to find nearly 10 minutes of stoppage time. This was a truly courageous performance by Vale as they held on to win the game and become the Combined Counties Division One Champions.